FILE - Iraqi forces backed by tribal militias during battle to retake a village from the Islamic State on the eastern bank of the river Tigris, Iraq, Dec. 7, 2016. Iraqi leaders say they doubt their forces will oust Islamic State fighters from Mosul — the terror group’s last major urban stronghold in Iraq — before Easter, despite a spurt of progress in recent days that saw the troops reach the Tigris River for the first time in the battle for the city. The jihadists have not only mounted stubborn resistance, but expanded attacks elsewhere in the country — from a wave of suicide bombings in the suburbs of Baghdad and southern Iraq to launching disconcerting raids in Anbar and Salahuddin, provinces that fell to government forces weeks ago. 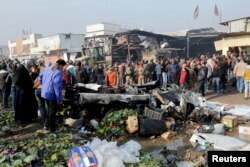 FILE - People gather at the site of a car bomb attack at a vegetable market in eastern Baghdad, Jan. 8, 2017. 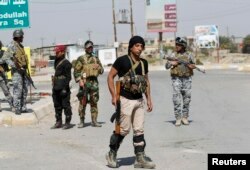 On January 2, IS fighters overran a police station in Samarra, holding it for several hours. They also have been threatening the Mosul-to-Baghdad highway. The attacks are clearly aimed at distracting Iraqi security forces. That so far hasn’t happened, and Iraqi forces' advances in the city marked a significant moment in the 12-week fight to recapture Mosul. Gen. Abdal-Amir al-Lami, Iraqi deputy chief of staff for operations, announced Sunday that security forces seized the eastern end of one of the Tigris River bridges linking the two sides of the city. He says Iraqi soldiers are consolidating their hold on the riverside Beladiyat district. North of Beladiyat, Iraqi forces made another breakthrough toward the Tigris in the Muthana neighborhood close to the ancient Assyrian ruins of Nineveh. Iraqi army spokesmen say IS harassed Iraqi troops as the forces punched their way to the Tigris, with drones dropping grenades on them. IS resistance is "showing signs of collapse" in east Mosul, Brett McGurk, the senior U.S. official in the counter-IS coalition, said in a tweet Sunday. The recalibration of Iraqi units undertaken during a two-week lull in fighting that ended on December 29 partly explains the progress made in recent days, say analysts. 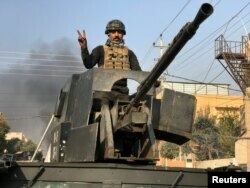 “One causal factor was clearly the concentration of all available ISF forces [Iraqi security forces] in east Mosul, achieved by closing down ancillary assaults north and southwest of the city,” said Michael Knights of the Washington Institute for Near East Policy, a research institution. A member of Iraqi security forces stands in a military vehicle in Baladiyat district, east of Mosul during a fight with Islamic State, Jan. 9, 2017. Iraqi forces are benefiting also from the battlefield presence of coalition special forces. They have been advising and helping to coordinate more accurate artillery and air support. “The Coalition and ISF introduced new accelerants that revived the push, including advisers embedded at a lower level and increased ISF deployments, allowing the ISF to make significant gains in eastern Mosul from December 29 to January 3, 2017,” according to Emily Anagnostos of the Institute for the Study of War, another Washington-based research group. “This raises the risk of civilian casualties but can stave off further attrition,” Anagnostos says. Iraqi units are now present in 35 of 47 neighborhoods in the eastern half of Mosul. Even so, that leaves the 29 heavily populated districts of west Mosul so far untouched by ground battles. Knights predicts east Mosul may be cleared of IS fighters late this month, at the earliest, but that the battle for west Mosul will go well into the second quarter of the year. If the fight drags on, there are likely to to be growing calls for the Iran-trained Shi’ite militias to be called in to help, say analysts. Shi’ite politicians led by Iraq’s former prime minister Nouri al-Maliki, whose sectarian policies are blamed by some for the rise of the Islamic State group, are arguing that the militias, known as the Hashd al-Shaabi, or popular mobilization forces (PMF), should be used in the battle to oust the jihadists from Mosul. FILE - Sunni fighters who have joined Shi'ite militia groups known collectively as Hashd al-Shaabi (Popular Mobilization), allied with Iraqi forces against the Islamic State group, carry weapons as they stand guard in al-Alam Salahuddin province, March 15, 2015. The Shi’ite militias are mainly west of the city and Iraq’s prime minister, Haider al-Abadi pledged, before the campaign to retake Mosul was launched, that they would not be used in the fighting inside the mainly Sunni Arab city. In late November, al-Abadi’s supporters in Iraq's parliament voted to put the PMF on the government payroll and incorporate the militias in the national armed forces, ostensibly subordinated to the Iraqi military hierarchy. After the November law passed officially incorporating the PMF into the national army, U.S. and Western military advisers started to train some Shi'ite fighters from militias considered not to be taking orders from Iran. Last month, Gen. Stephen Townsend, who commands coalition forces in Iraq, described Hashd al-Shaabi as “remarkably disciplined” and said the United States was “going to try to shape” the law that legalized the Shi’ite force.